Perlier’s White Almond line contains Organic Sweet Almond Milk and White Almond oil, both richly concentrated in natural emollients and nutrients from Italy. Ideal for dry or delicate skin types, White Almond offers moisturizing protection, leaving the skin smooth, fresh and supple, furthermore it contains large amounts of magnesium - an essential enzyme activator - that plays a part in the formation and maintenance of skin protein. A delightful bonus is the delicate scent of sweet almonds in each product. 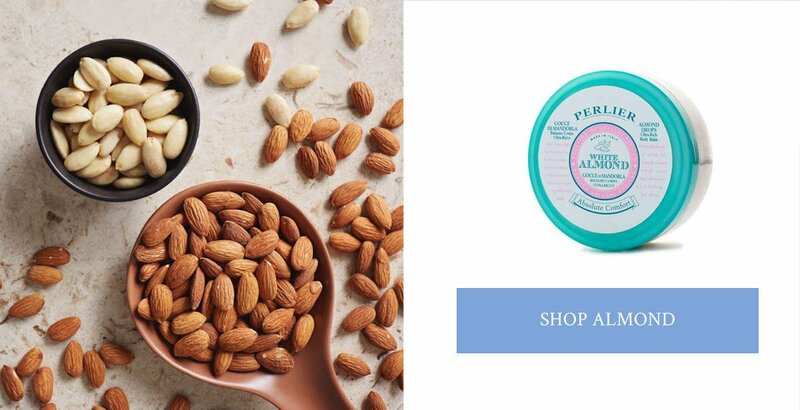 Perlier’s White Almond line is made from the purest oil from cold pressed Italian Almonds. Exceptionally rich in Vitamin E, protein and essential fatty acids, these help protect, nourish and infuse new elasticity into dry skin. The fragrance is addicting and similar to marzipan. Why is Perlier’s Almond so Unique? From the heart of White Almonds, Perlier has cold-extracted an oil rich in Vitamin E and essential fatty acids. This fabulous formula nourishes the skin and reinforces the elasticity for a younger looking skin. Ideal to prevent and fight the look of stretch marks, for a more toned and firmed body. The sensation of dryness is soothed and skin regains comfort and softness, wrapped in a delicate perfume of Almonds.